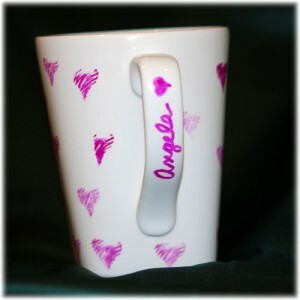 I saw this idea here: His + Her Sharpie Mug DIY at A Beautiful Mess. 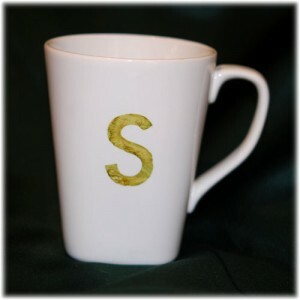 The ones she did were so cool, but I cannot handwrite like that, and I certainly can’t draw anything but I really wanted to make some of these for gifts. It was too good of an idea not to try. I CAN however stamp! So, that’s what I did. It’s such a wonderful, simple idea. I actually tried cutting out stencils using my Cricut, but the Sharpie bled underneath and it didn’t look very good. So, I simply stamped my pattern on my clean mugs. I did handwrite the names on the handle of the mug, but everything else was stamped. The hardest part was deciding what to put on them. 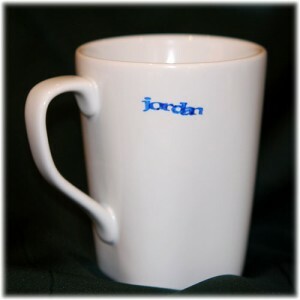 Use the Sharpie and mark on the stamp, then stamp on your mug. Be careful as the stamp will want to slide if you let it. You can wipe off mistakes, but the sooner you do it the easier it is. If you let it dry too much, you will have to give it some elbow grease and maybe a scrubbie sponge. I was able to clean mine up several times when I was trying to decide how to decorate them, so don’t worry about experimenting. While you are doing this, let your oven heat up to 350 degrees (F). 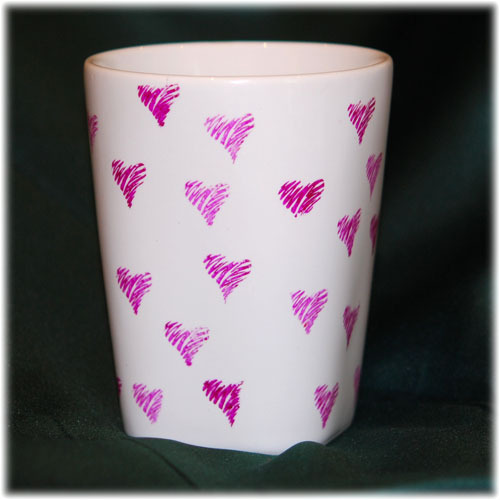 Be careful not to smear your designs before they are dry. “Bake” them at 350 for 30 minutes. Be careful taking them out, they will be hot. After they cool, the designs should be set. According to the other website, they will hand wash fine, but are not safe for the dishwasher. Let me repeat DO NOT WASH IN THE DISHWASHER! I think they would be fun gifts for kids to make for Mother’s and Father’s and Grandparent’s Days also. 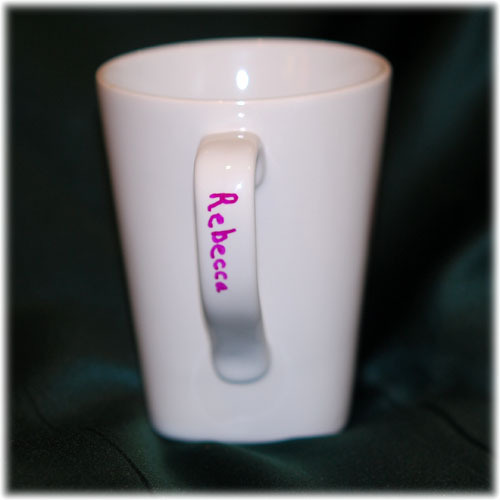 Who wouldn’t like a child’s name written in their own hand on your morning coffee mug?! They’re fab! I’ve seen this idea around and might have to try it. I’m missing one of my granddaughters – she lives in London (right in the middle of Olympic madness – apparently the traffic has special lanes just for Olympic traffic) which is probably not as far as your grandson is from you but it’s still far enough that we don’t see her much. It really doesn’t matter how far, if you cannot get there often it might as well be on the moon! (well not quite but almost). And they grow up so fast you hate to miss a minute of it. Thank you all. They were so easy. I just finished another for my husband to take to work. Was hard to find something manly but easy enough for me to do. I am having trouble with my colored sharpie setting … I have cooked it even longer than 30 mins and it still rubs off… do you have any solutions….the black seems to bake in right but the colored doesn’t… is there something i can put on it to help it set in? Sorry to be so very late in responding to this question. I do appreciate questions and comments (and also improvements!) to things I post since many of my crafts are experiments on my part (altho I do try to do as much research as I can before I blog them). 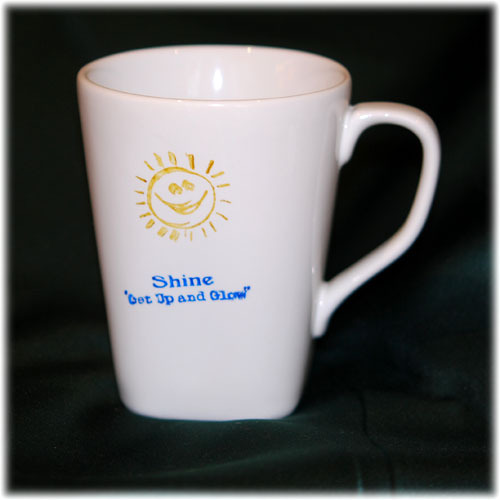 I will try some different things with the mugs, as I have intended to do more anyway. I didn’t really have any trouble with the colored ones I did, BUT I did a colored mug (red) for myself and the marker didn’t last at all on that one. I used the same type (Sharpie) so I’m kind of at a loss. I am sure it was because it had a different sort of finish because of the coloring (altho I believe it was the same brand). So, I wonder if the problem for you might be the sort of finish on your mug. Of course if the black is adhering that doesn’t make *perfect* sense, but maybe the colors just need a little more tooth on the surface. I am unsure. This calls for more experimentation. I know my answer is not very helpful, but it’s all I have. Thank you anyway for coming by. Also, if you tried anything else, please let me know. Oh, and I didn’t want to do any sort of spray on stuff since I do use mine for drinking. Oh, and as an aside, many of my store bought mugs with images also eventually wear or fade away. I have always wondered why that was. If someone has some insight, please share! I started doing these after reading another article a few months back & everyone I give them to loves them. 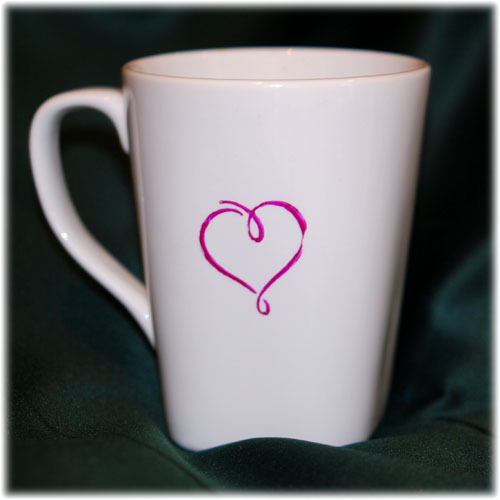 I had trouble w/color too @ first & especially color on colored mugs, so I experimented . I have to do more than 1 coat, just like when I redo furniture. >1st coat then bake on 250 1hr. & totally let dry then do a 2nd coat & bake again on 250 for 1 hr.. I don’t use for 24 hrs. & I made mistake 1st time putting in my bleach water so don’t use bleach. Wow, thank you for this, I’m going to try it. Mine have been cute but yes, they don’t last even with hand washing and the colored ones are worse. I’m going to try your advice! This is what I love about the internet!